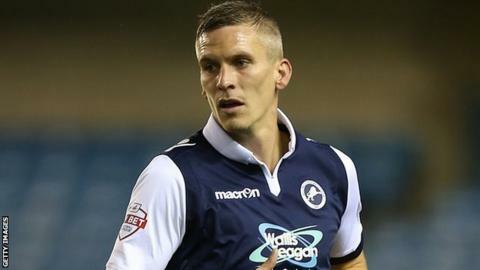 Steve Morison scored a late winner to help Millwall stay in play-off contention. Millwall kept in the play-off hunt as Steve Morison's late header gave them victory over struggling Oldham. Lee Gregory's early goal put Millwall ahead, the striker finding the bottom corner from inside the six yard box. Mike Jones and Rhys Murphy went close for Oldham before the former found the top corner with a free-kick to level. The Latics twice tested David Forde as they sought a second before Morison headed in Shane Ferguson's cross to give Millwall the points. They moved up to seventh in the table, only three points outside the play-off places, while Oldham remained 22nd. "We know where the issues are, it's both boxes. We're getting caught out too many times defensively, little switches of concentration are killing us. "We can't be putting in any more work in hours-wise, out on the training pitch trying to put things right. Certainly on balance of the last three performances, we are improving game on game. We need to start backing that up with points. "We we're up against a huge team at this level. We've gone and competed against them and won battles across the pitch. All you're in control of is your performances and they are improving." Match ends, Oldham Athletic 1, Millwall 2. Second Half ends, Oldham Athletic 1, Millwall 2. Timothee Dieng (Oldham Athletic) wins a free kick on the left wing. Substitution, Oldham Athletic. James Wilson replaces Daniel Lafferty. Substitution, Oldham Athletic. Ricardo Fuller replaces Brian Wilson. Goal! Oldham Athletic 1, Millwall 2. Steve Morison (Millwall) header from very close range to the bottom right corner. Assisted by Shane Ferguson with a cross. Corner, Oldham Athletic. Conceded by Joe Martin. Corner, Oldham Athletic. Conceded by Byron Webster. Cameron Dummigan (Oldham Athletic) wins a free kick on the right wing. Attempt saved. Carl Winchester (Oldham Athletic) right footed shot from outside the box is saved in the top right corner. Corner, Oldham Athletic. Conceded by David Forde. Corner, Millwall. Conceded by Daniel Lafferty. Jake Cassidy (Oldham Athletic) wins a free kick in the defensive half. Substitution, Millwall. Aiden O'Brien replaces Jed Wallace. Attempt missed. Liam Kelly (Oldham Athletic) right footed shot from outside the box is close, but misses to the left. Goal! Oldham Athletic 1, Millwall 1. Michael Jones (Oldham Athletic) from a free kick with a right footed shot to the top left corner. Corner, Millwall. Conceded by Brian Wilson. Shane Ferguson (Millwall) hits the left post with a left footed shot from the left side of the box following a fast break. Second Half begins Oldham Athletic 0, Millwall 1.